In the week leading up to Saturday the 25th there had been much discussion about the storm prospects. A trough of low pressure would aligned over eastern NSW. Stiff NE winds on the coast should supply moisture, and although NW winds dominated above 900mb the dew points would still be reasonable. Another positive factor was a good shear profile with a nice jet at 300mb. On the down side middle layer moisture would be in abundance. To be honest when I did my eyeball analysis ( my number one preferred model ), I was not overly impressed by what I saw on Saturday morning. The sky was dominated by low cloud from the NE. It was not overly warm either - only around 20C. Around 11.30am the first showers in my target area were visible on radar. I hit the road for yet another interesting trip up the infamous Macquarie Pass. Conditions at the top of the pass were not what one would associate with storm chasing. Low cloud hung like a table cloth along the escarpment - visibility at what was now 1pm was 2-3 cars ahead. 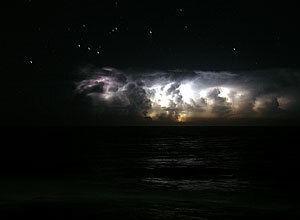 My state of mind received a jolt back to positive when I tuned in the AM radio, the lightning static was one constant noise and it was loud. It did not make sense, here I was fogbound, yet the AM radio suggested m ajor storm activity with 100 km. Pushing further west and the fog lifted but not the cloud. Where were these storms? I headed SW to Bundanoon where finally I saw Cg's ahead. 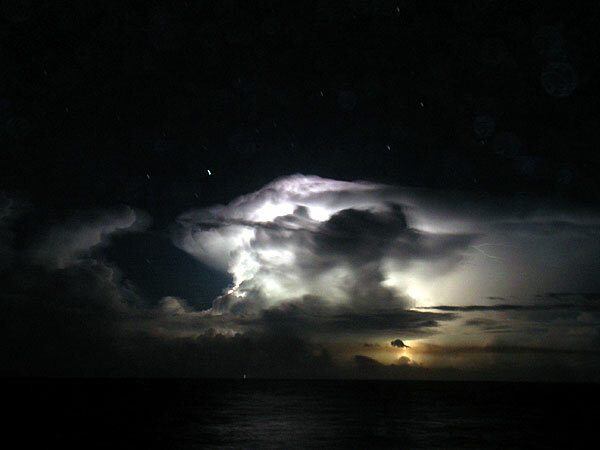 The storm had no structure visible. There was brief heavy rain, small hail then sunshine. The storm had cleared all the low junk cloud in its wake. The rear of the storm provided one of the few photos of the day with a nice hail shaft. There was little else that afternoon in the area. A supercell affected Sydney just 2 hours to the NE. 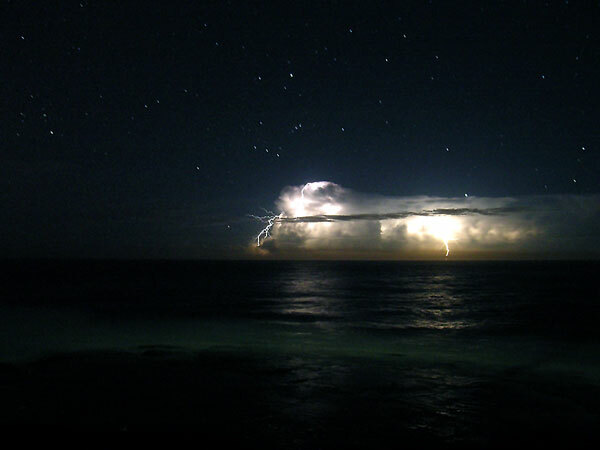 A consolation prize however was a great little lightning show offshore that evening. 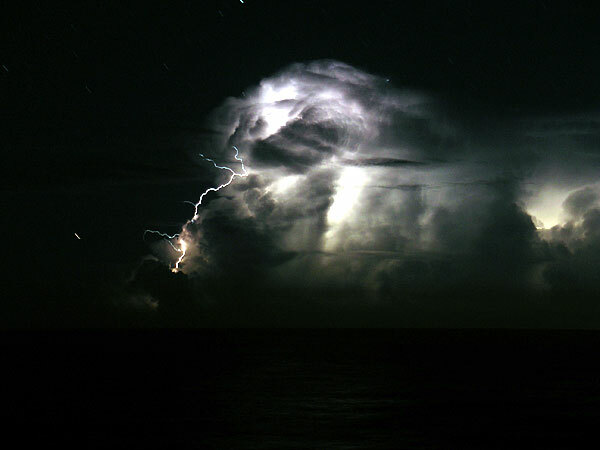 As the trough moved off shore it rapidly cleared the air behind it, this finally gave some structure shots albeit in the dark. 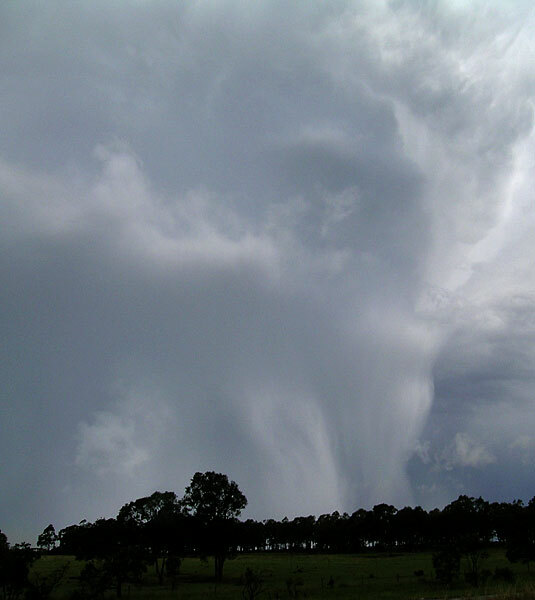 Other accounts of storms this day including a supercell in Sydney. Sydney storm chasers - chaased the Central Tablelands this day. Meanwhile 900kms to the north the lads from Australian Severe weather bagged another supercell.